How much does ERP cost for wholesale distrbution business in 2017? Now is a great time to ask yourself a question – is your wholesale company ready to meet the modern market and new demands? And of course, you want to succeed without making a big sacrifice from your profit. Well, you are in luck, because this article describes how to run a wholesale business in this new environment using new technology, such as ERP. 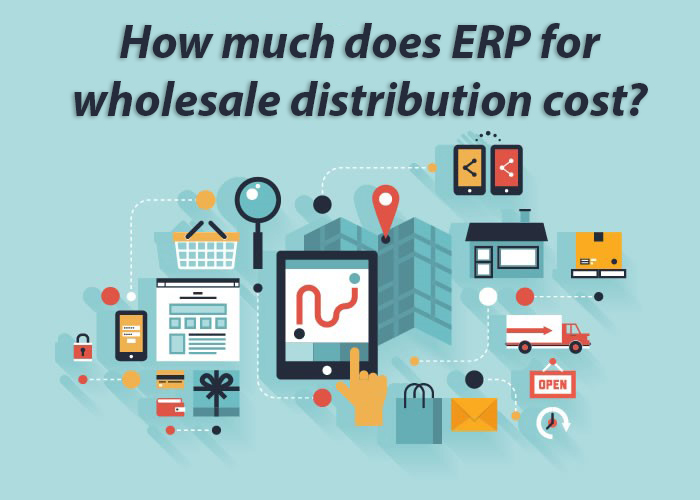 And how much does ERP cost for wholesale distribution business? Do you need an ERP for your wholesale distribution business? First of all, we need to figure out why you need an ERP in your wholesale business and do you need to even bother calculating the ERP cost for wholesale. There was a recent survey that asked many E-Commerce wholesalers about their main challenges in business. You may predict some of their answers such as cost reductions, growth management. However, there is another challenge they all have to face, it is always changing customer needs. The ability to shop online has opened new ways and channels for shopping, but also opened up the local markets for new competitors. Therefore, to be successful, sellers must get everything right – time, place, customers, price, products. So, what do you need in order to achieve this? Information. And ERP will provide you with all necessary data you need. That’s one of the reasons why ERP cost for wholesale is so important. The best wholesale sellers have implemented following strategies using ERP in order to improve communication with customers and lower the costs. It is always a good practice to follow the footsteps of successful ones. So let’s research what did they do to get and stay on top, while we are at it, you will see why ERP cost for wholesale is worth it. When the leaders of the wholesale market were lowering the costs and improving profit margin, their main concern was to streamline processes and to optimize supply chains. Optimized supply chain means that you can manage inventory and prices more effectively. Again modern technology is a great help, ERP performs great in this area. In order to improve relationships with customers leader of the wholesale market have prioritized collaboration and service. Let us explain. This means that they intend to better understand the customer needs, as well as making it easier to change anything in the way organization handles the delivery and a workflow overall. However, we can’t argue that for some wholesale distributors, new methods of delivery or improved internal collaboration is hard to implement. That’s why the top strategy of all wholesale leaders is modernization via Enterprise Resource Planning software, such as EasyERP. However, to save money the try to cut as much as possible from ERP cost for wholesale. As we have stated before, success in the wholesale customer management is all about getting products to customers in time and great interaction with the supply chain. That’s why the best in wholesale business choose ERP solutions with included Customer Relationship Management solution. This way, the get a centralized portal for customer data and supply chain management information. These technologies improve communication with the customers, so it is easier for them to buy from you, thus improving your sales. If you combine better access to customer information with a productive way of managing the supply chain you will make your company more agile and adaptable. The more successful companies tend to have CRM software combined with ERP. Also, they are more likely to implement an E-commerce customer self-service portals. Thus, facilitating communication with the customers, making ERP cost for wholesale worth spending. Don’t believe us? Check out the following report. We have divided all of the wholesale companies into two categories based on their performance. So, there are Leaders, top 35% of the companies, and followers – the rest 65%. Notice, that leader of the wholesale market are more likely to have business analytics integrated into ERP. How can it help? You may ask. Well, this allows current companies to make better-informed decisions, like more accurate demand planning. Another popular feature, that improves the agility of your company is the ability to use your ERP from a mobile device on the go. This way, you or your employees in the warehouse or on the road can immediately access necessary information enabling immediate reaction. Working off the ERP cost for wholesale. Now you may be sure, successful wholesale companies are using ERP software for many reasons, and they are not shy for paying the ERP cost for wholesale. As you already know, ERP system is a software package that can take care of accounting, inventory management, CRM, human resources management, and many more business tasks. ERP systems are complex a software solution. So in order to make it work right and stable, you will need to do some technical preparations. So, you will spend some time on that. Or, add a cost of necessary technical support to your ERP for wholesale cost sheet. A good practice will be to also setup a test environment for your new ERP, you test it without risking your company’s important data. As we have stated before, ERP is an all-in-one software solutions, that will cover almost every aspect of your business. Naturally, it cannot be just picked up and used. You will need some kind of training. Sure, you can teach yourself just by reading the documentation, but that is not always an option. So be prepared to spend some cash on training your employees. Most of the time ERP vendor will be happy to provide you with consulting service, for a fair price, of course. So, when you are picking out the ERP for your wholesale business take the training cost into consideration. Sometimes the out-of-the-box state of your ERP will not be enough to cover all aspects of your wholesale business. Everything is personal in this aspect, all depends on the nature and details of your business. But, this is no reason to decline ERP for your wholesale company, all you will have to do is to ask the developers of ERP to customize it a bit for you. Or, if it is in your agreement with the vendor, hire a third party developer to maintain ERP later on. Anyway, this is very personal and cannot be calculated beforehand. So, if you are sure that the default ERP will not meet all of your needs, ask for an estimation of necessary adjustments. So you will not what to expect. Regardless, if you are upgrading from another type of software or is this your first ERP software in business you will need to redesign some processes in your wholesale business. In theory, implementation of ERP software should automate many of day to day tasks. As the previous cost category, this is very individual for every business. Even if you are migrating from one ERP to another, you will have to change some processes. Thus, make sure you book some time and money in order to redesign the working flow of your wholesale business. Every software is being upgraded from time to time. Usually, this is a good thing. First of all, make sure that your ERP will be upgraded for free. Also, consider how often you expect your ERP to be upgraded and try to anticipate the costs of that. Maybe some hardware in future will not be able to run a new version of ERP, some stuff like that. Also, don’t forget that any update can affect your business workflow, so it is a good practice to make backups of your information. One way or another some of your employees will run into trouble using the new ERP you have installed. We won’t dig into why this may happen, all we want to say is you need to ensure that the vendor of your ERP system is willing to provide customer support. And don’t forget to examine the quality of it. Don’t forget to make sure that this support is included in the licensing fee, so you won’t be charged for every question you have. So, is the ERP cost for wholesale worth spending? Absolutely. We have shown you that implementing powerful ERP capabilities in your wholesale business is the right way to go, the leaders in this field are using it already. Thus, in order to be able to compete with them, you need that boost in performance too. And EasyERP is a great solution for you!